Is poetry always Lost in Translation? A poem is an artifact constructed from carefully chosen words; changing the language can’t help but – in some part – destroy the original creation. RBTH literary critic Phoebe Taplin explores Russia’s resurgent poets—in English. In 2010, Dwight Garner argued in The New York Times that poetry was no longer significant in modern Russia; the massive success of the recent, satirical “Citizen Poet Project” shows this is far from true. Many Russian poets are creatively thriving, but do their works survive the transition to another language? Polina Barskova was a poetic child prodigy. Her first poems were printed in journals when she was nine years old and published in book form at just 15. She graduated in classical literature from St Petersburg University and transferred, aged 20, to the University of California, Berkeley, to continue her studies. 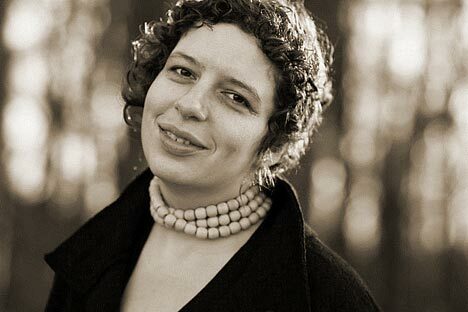 She now teaches Russian Literature at Hampshire College, where she also founded a poetry group; students have praised the “inspiring, creative atmosphere” in her popular classes. Barskova’s dissertation, completed in 2006, was called “Enchanted by the Spectacle of Death” and dealt with culture in early Soviet era Leningrad, a topic she is still researching. Death is a theme that runs throughout Barskova’s poetry. The opening poem in the recently translated collection, “The Zoo in Winter”(Melville House, 2011), starts: “I will not kill myself.” The title poem, drawn from her newer works, written in the last few years, describes a deathbed scene. Another new poem picks up Ariel’s song about drowning from Shakespeare’s “Tempest”and plays with the imagery of aging fathers and the fragility of life. “Breath is a very tiny thing, rounded by dreams,” she writes, echoing one of Prospero’s later speeches. Drawn to cemeteries, where she honors dead poets like Anna Akhmatova, Barskova is fascinated and repelled by suffering: homeless people, concentration camps, war. There is an element of self-consciousness in her intimate poetic discussions of these topics: “Susie Sontag’s writing about war,” she writes in “The New Iliad,” “It’d be good for me as well, I guess …,” but “I cannot. I’d like to – I cannot.” Later in the poem she asks: “My Patroclus, tell me, what shall I do / In this resplendent tent ...?” The poet compares herself to the great warrior Achilles, who spends much of Homer’s Iliad sulking in his tent and refusing to take part in the Trojan War. The first poem is dedicated to Lewis Carol. Although it’s hard to see any obvious connection with the author of “Alice in Wonderland,” the title serves to introduce another crucial theme in Barskova’s work: the fusion of Russian and western traditions. “I / Am the result of multiplying / Coleridge by Leningrad,” she tells us. This cultural intermingling can be uncomfortable for a non-expert reader. Barskova frequently refers to other Russian writers in obscure and glancing asides which suggest she either assumes her audience is familiar with these names, or that she doesn’t care. Like many writers, she continually echoes Pushkin, playing on his name, borrowing his images (like Eugene Onegin’s brands of champagne or firearms), his actual lyrics or his stylistic patterns. It is impossible to guess how far the bewildering complexity of Barskova’s writing is exacerbated by translation. The fact that the author herself helped the two translators, should give the English version a certain authority, but ultimately the age-old problem of translating poetic works remains: a poem is an artifact constructed from carefully chosen words; changing the language can’t help but – in some part – destroy the original creation. This is especially true of this kind of poetry where sounds and dense allusions, images and formal conventions are the essence of the final work. The translators state in the introduction that they chose poems that “lent themselves to translation.” It is hard to imagine how complex and self-referential the remaining works must have been. Rhymes are notoriously harder to come by in English than in Russian; luckily Barskova rarely rhymes. There are visible problems of translation in “The Zoo in Winter,” especially during the “Farewell” sequence of poems, which refers at one point to the “viscious (sic) circle” of life; a flaw like this would matter less in prose. Each poem in the sequence starts with a reference to a different character from Hamlet. Most of the quotations are translated back into Shakespeare’s original poetry, but one of them stops in mid-sentence and Gertrude’s beautiful lines about Ophelia are so nonsensically mangled as to undermine faith in these renditions of Barskova’s intriguing work. In fact, there is a surprising degree of continuity in the themes that have obsessed Russian poets through the ages: home, history, mortality, inspiration, and the natural world. Several poets in Smith’s anthology visited graveyards to pay their respects to their literary heritage; at least four of them have written poems about Pasternak’s grave in Peredelkino. There is the same wrestling with split identity; the exiled poet Joseph Brodsky, “a Russian poet and an American essayist,” perhaps epitomized the struggle, but many writers still engage with it.